Ever wonder who’s actually reading your Facebook Group updates? Now you don’t have to. The social network has announced that Read Receipts will be coming to Groups, enabling members to see who has read each post. Originally introduced for Facebook Messenger, Read Receipts will allow any Group member or admin to see a drop-down list of the names of everyone who has seen the post and when. As soon as one person sees it, a checkmark and count of the total number of impressions will be displayed. 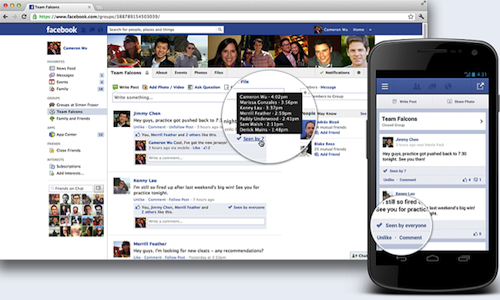 Facebook will add “Seen by everyone” if you’ve reached your whole Group. However, it’s unclear how Facebook defines “seen,” whether it counts an individual visiting the Group Page or having the story load in the News Feed. This is a valuable feature for Groups, as it can help you gauge the effectiveness of critical information being shared. Additionally, it can help you understand if your content is a hit or miss among your members — something that can be challenging when people aren’t engaging with the post. Although it hasn’t gone live for us yet, Facebook began rolling out Read Receipts on Tuesday. It will be available for both desktop and mobile version of Groups.